This week I tried to flip the coin so to speak and look at the culture of Asian pop fandoms as opposed to the Asian popstars and performers I’ve largely been looking at up until now. To be more specific I decided to narrow in on the peripheral fandoms that tune in every week to watch the Australian Asian pop music video show SBS PopAsia. 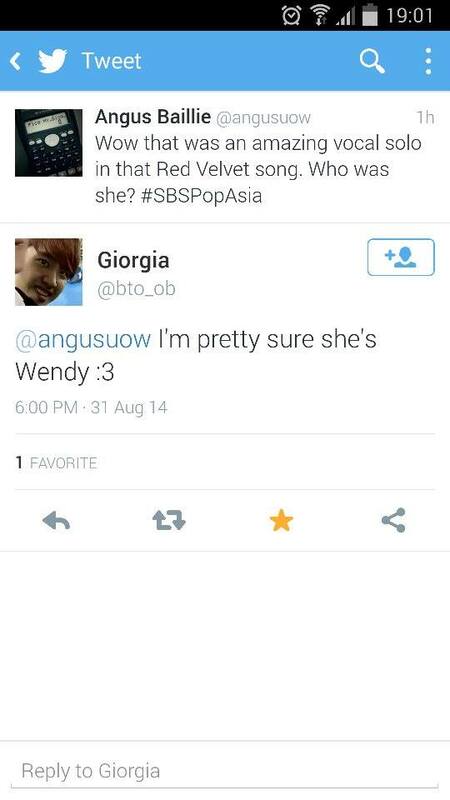 A big part of every week’s countdown is Tweeting along with the episode using the hashtag #SBSPopAsia, which is used to play games, nominate artists/songs as well as create an actively vocal audience whose Tweets are cherry picked for screen time during the episode (SBS PopAsia HQ 2014). In the hopes of better understanding the fandom I decided to tweet along in the hashtag during the episode and collate some examples of the fandom in action (shown above). My initial experience was bewilderment as a scrolling wall of tweets cycled rapidly across my screen, filled with the kind of ecstatic glee you might expect from a crowd at a live event. It becomes clear quite quickly that a lot of these fans tweeting along with the show are active participants in the fandoms of these pop artists outside of the bounds of the show, as most of them display a level of knowledge about the individual artists and performers that is not only absent from the show itself, but recalled rapidly in response to the events of the show. In other words, the reaction time of the tweets suggests this information is not being looked up beforehand. I did try contributing to the discussion, guessing which common element was present in the 3 songs they played consecutively and generally commenting on the songs as they played, but I found the experience largely distant. Things move too rapidly; with too much vigor and desperation to be noticed for the fans to engage with each other too much it seems. Although the one question I did ask the group actually received a response, even if it was just the one. I think that researching these fandoms properly will require looking at how they behave on the other social media platforms, such as Facebook and Twitter, that move much more slowly and with more of an air of contemplation. I approached this group expecting more of a conversation but instead I learnt that it was much more like a mass-aggregation of quick, yet vocal monologues. It seems to be a similar response that people have had when communicating with a live audience online. Live chat feeds provide another layer to the content they are commentating on. But the majority of comments seem to lost in the vast amount of feedback. I think people’s natural desire to share their opinions seem to fuel this though, and social media sites like Twitter and Facebook facilitate this urge to tell everyone what you think about everything.